Jalapeno Stuffed Olives make this burger hot & spicy. If you want to tone down the heat, you can substitute sliced green olives for a mild taste. Make hamburger patties. Broil till cooked through. 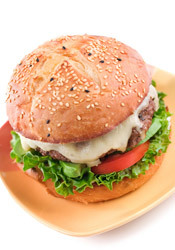 Slice Monterey Jack cheese and place one slice on each patty. Return to broiler for 1 minute. Spread a dollop of 1000 Island dressing on the bottom half of each hamburger bun. Place broiled patty first, then tomato slice and smother with sliced Jalapeño olives. Crown with the top half of bun.